Holidays are in the back of the corner, and you are planning to visit Australia. Apart from tasting the local gastronomy, you really crave Indian food. 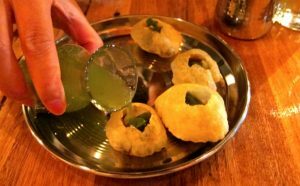 In this article, you are going to discover the best Indian Street food in Melbourne and Sydney. If we enter Glebe, in the Inner West region of the City of Sydney, we can find Bombay Street Kitchen. It’s open every day from 17:30 to 22:00. And it’s well-known for its goat curry, fish curry, pav bhaji, panipuri, and Garlic Naan. But what people truly enjoy is the friendly and welcoming service they receive from the staff. It has a variety of products adapted to vegan and gluten-free diets, apart from offering delivery service. It’s classic Indian cuisine adapted to modern times. Another place that you can’t miss is Indian Street Food By Billus. This one is in Circular Quay and its known for its signature Kathi rolls. These rolls are made with flatbread, tomato, lettuce and onion and a variety of fillings such as crispy chicken, tandoori chicken, paneer tikka or spiced lamb, among others. If you like to start the day with Indian food in Sydney, you can have breakfast there, and it offers many conveniences such as menu for kids, wheelchair access, location close to parking, availability for functions, among others. If you are visiting Melbourne, one of the most well-known Indian food places where you have to go is Babaji’s Kitchen. You can find it in Belgrave; as well as during festivals where they are commonly present. Indeed, if there is an event in Belgrave, you may probably be able to spot Babajis Kitchen as part of it. Make sure to taste their kebabs and South Indian dosa (pancakes). They say they are the best in town and there must be a reason for it. Another place that you must try is Delhi Streets. In this Indian restaurant in Melbourne, you will feel immersed in a vibrant atmosphere, and you’ll be served a great selection of traditional Indian dishes. This restaurant had an excellent reputation and was awarded the prize of Good Food Cheap Eats Winner 2016. Go visit it! Finally, located in a hidden place of Springvale, we can find Chai and Chaat Indian Street Food. If you like gol gappas, paapdi chaat, bhel puri masala dosas, idli sambar and masala chai, this is your place to go. But their speciality is paani puri. Absolutely crispy and delicious! As you can see, if you are an Indian food lover and you are travelling to Australia, you have multiple options where you can find this gastronomy’s dishes. Furthermore, you are even able to make orders online and have the food delivered to the place where you are staying. Make sure to make a stop in our selection of best Indian restaurants in Sydney and Melbourne and… bon appétit!